This report deals with selective proximal vagotomy and pyloroplasty in the treatment of ulcer disease. 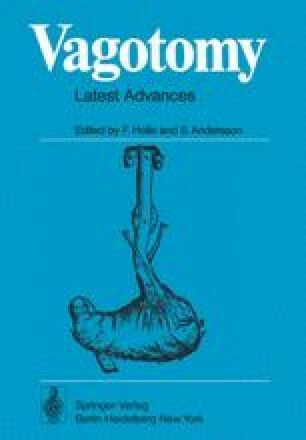 In a 10-year period (Jan. 1st 1964 to Sept. 15th 1973) 1105 vagotomies were carried out (Table 1 ) 81% were performed as SPV, primarily in gastro-duodenal ulcer, but also as a supporting procedure in hiatal hernia, cardiospasm, erosive gastritis and stomal ulcer (Table 2). Of 892 ulcers, including elective and emergency cases, 790 were treated by SPV and pyloroplasty (88%). These nonresecting procedures were evaluated by clinical examination, X-ray, endoscopy and gastric hormonal and secretory studies. The results were obtained by personal examinations, questionnaries, communications from referring physicians and in some cases from other hospitals.